In this posting, I want to take a very brief look at the history of the founding of America's Central Intelligence Agency and provide quotes from an American president regarding his views on the CIA and what should be done to control its seemingly unfettered powers. 1.) Office of the Coordinator of Information (COI) - Established July 11, 1941 - duration of 337 days. 2.) 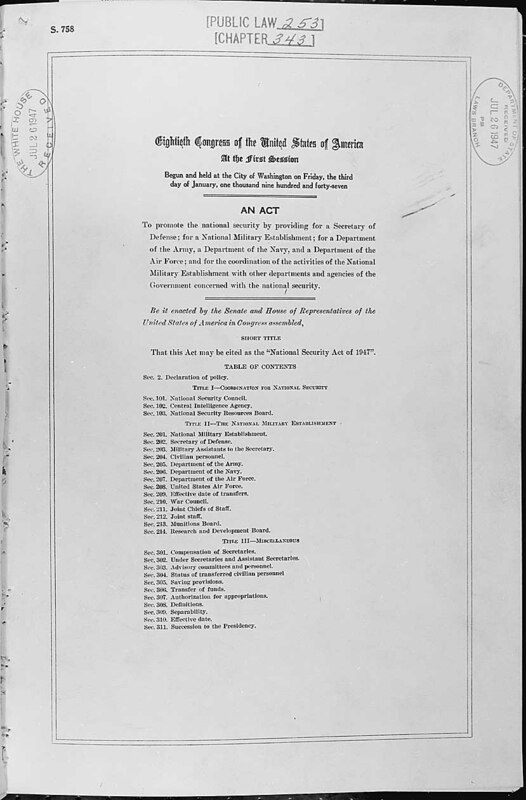 Office of Strategic Services (OSS) - Established June 13, 1942 - duration of 3 years and 3 months. 3.) Strategic Services Unit (SSU) - Established October 1, 1945 - duration of 1 year and 5 months. 4.) Central Intelligence Group (CIG) - Established January 1946 - duration of 1 year and 6 months. 5.) Central Intelligence Agency (CIA) Established September 18, 1947 - duration 71 years. With that background, I would like to change gears and look at some comments and concerns about the Central Intelligence Agency from a United States president. These comments are particularly pertinent given the CIA's involvement in geopolitical meddling around the globe over the past 71 years, a small sampling of which you can read about here, here and here. "I think it has become necessary to take another look at the purpose and operations of our Central Intelligence Agency— CIA. I wanted and needed the information in its "natural raw" state and in as comprehensive a volume as it was practical for me to make full use of it. But the most important thing about this move was to guard against the chance of intelligence being used to influence or to lead the President into unwise decisions— and I thought it was necessary that the President do his own thinking and evaluating. Since the responsibility for decision making was his— then he had to be sure that no information is kept from him for whatever reason at the discretion of any one department or agency, or that unpleasant facts be kept from him. There are always those who would want to shield a President from bad news or misjudgments to spare him from being "upset." But there are now some searching questions that need to be answered. I, therefore, would like to see the CIA be restored to its original assignment as the intelligence arm of the President, and that whatever else it can properly perform in that special field— and that its operational duties be terminated or properly used elsewhere. Given the current world geopolitical situation and the American intelligence network's close involvement in the Russian meddling narrative, it's looking like former U.S. President Harry Truman's assessment of the Central Intelligence Agency back in 1963 was prescient.